Experience and enjoy the best of both worlds: the strength and grace of Pilates, with the tranquility of Holly Pond. Join the Darien Y’s Pilates instructor, Joyce Generoso, for a unique session on stand up paddleboards! Joyce will test your stability and movement through a variety of Pilates exercises, which will lengthen the body, increase flexibility, and improve core strength. The core muscles work as stabilizers for the entire body, therefore performing Pilates on a SUP board will provide you with the most effective training to strengthen your muscles. *Your instructor for PaddleFit Intro will greet you in the Front Lobby. Please make sure to arrive 10-15 minutes prior to your class start time. This will allow for time to complete the required waiver, store any personal items, and change into appropriate clothing. Sign up by clicking here, or visiting the Front Desk. Some SUP experience is necessary before taking SUP Pilates. 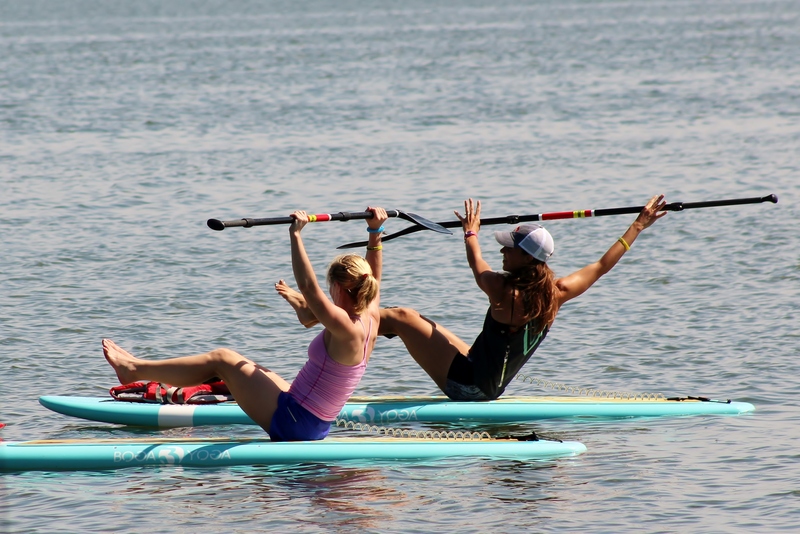 Please click here for the latest PaddleFit Intro classes and details. Can’t find a SUP class that works for you and a friend? Reach our to our Health & Fitness Director, Jess, at jvansciver@darien-ymca.org to set up a session!